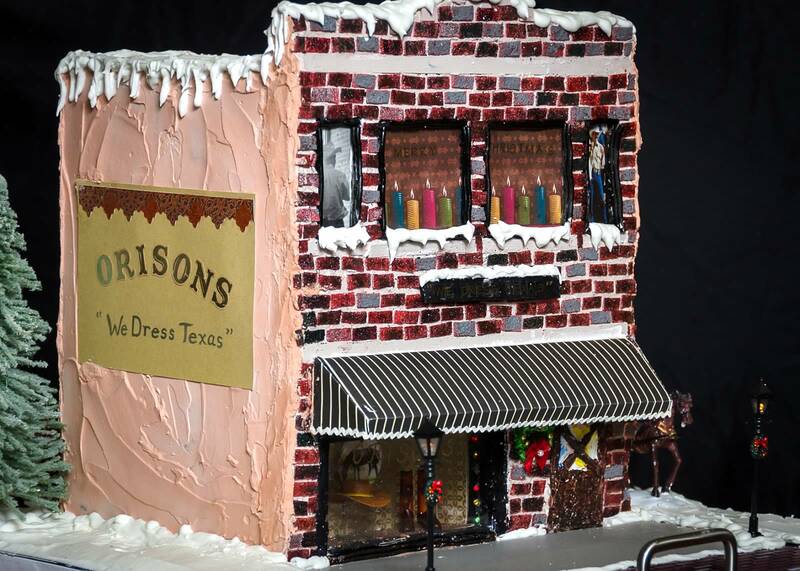 The gingerbread storefront created to resemble Orisons Boutique is on display now at the business in historic downtown McKinney. The Gingerbread for Humanity fundraiser to benefit North Collin County Habitat for Humanity is on Saturday, Dec. 14. Photo by Jim Davis of Go Life Imaging in McKinney. 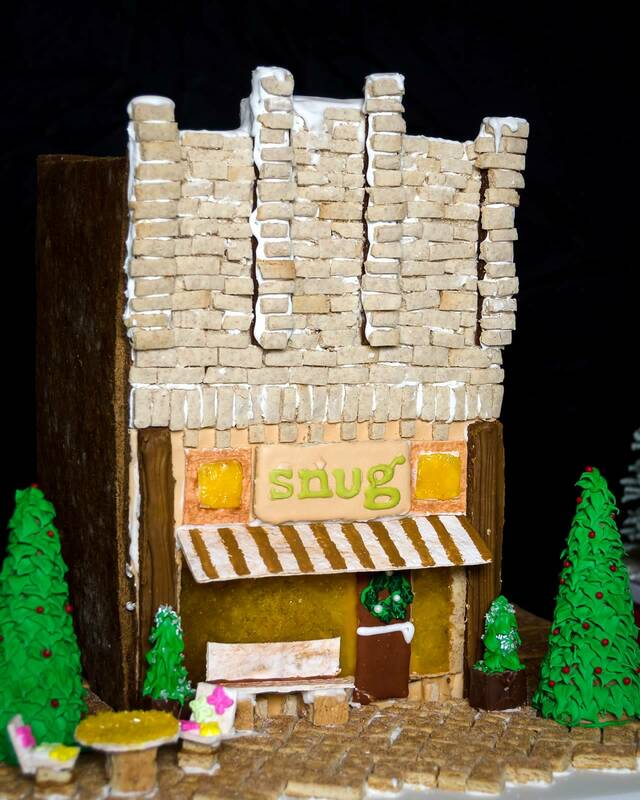 When you visit historic downtown McKinney this holiday season, be sure to stop by Snug on the Square, Orisons Boutique and Goodies Texas to see creative miniature gingerbread storefronts that look just like the actual businesses. These gingerbread masterpieces are part of an ongoing publicity campaign to raise awareness about the upcoming eighth annual Gingerbread for Humanity fundraiser at Trinity Presbyterian Church. From 9 a.m. to 1 p.m. Dec. 14, the public is invited to unleash their creativity and decorate a gingerbread house to take home while benefiting North Collin County Habitat for Humanity. Pre-registration is highly advised. To obtain a registration form, please go online to www.TPCMcKinney.org and click on the gingerbread icon. This creativity inspired event organizers to seek volunteers from the congregation to make and decorate gingerbread storefronts that could be displayed in downtown McKinney with the hope of increasing awareness about the Gingerbread for Humanity fundraiser. A dedicated team agreed to take on the challenge of building what Hatch calls “the extra-tough structural gingerbread storefronts” and decorating them to resemble the actual businesses. The volunteers’ work began this summer and was perfected through trial and error. Trinity member Myrt Bunje crafted the back of the Orisons gingerbread storefront to look like an old plaster wall. Photo by Jim Davis of Go Life Imaging. Tim and Amy Sherman baked the gingerbread storefront pieces using a secret recipe to ensure the gingerbread structures would stand the test of time. Pablo Ruiz and Andrew Bender served as the architects; Bender also served as the structural engineer and one-man construction crew, donating dozens of hours to build the structures. Myrt Bunje decorated the Orisons gingerbread storefront; Debra Guillemaud decorated the Snug on the Square storefront; and Bender decorated the Goodies storefront. 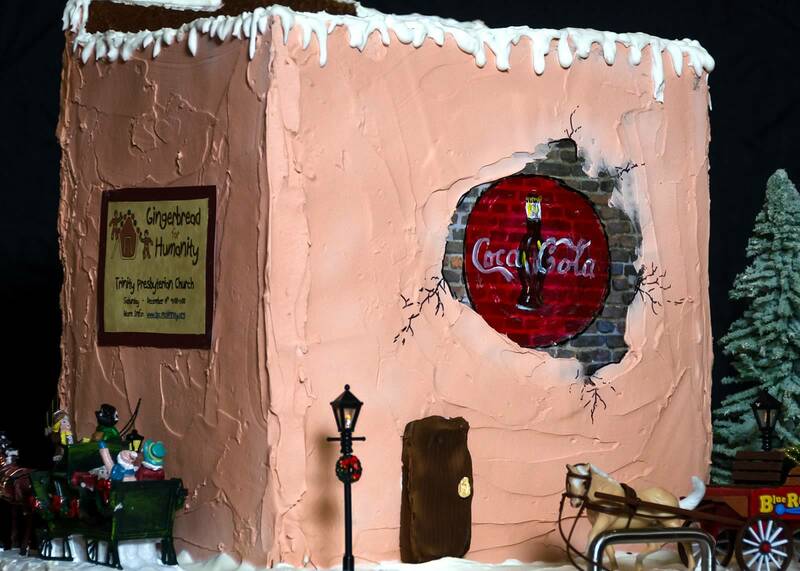 This gingerbread storefront is on display at Snug on the Square in historic downtown McKinney. Photo by Jim Davis of Go Life Imaging in McKinney. Guillemaud loved the creativity involved with the project and was determined to make the Snug storefront as edible as possible (except for its florist foam supports and foam board base). She made the bricks with sugar cookies and the paving stones with crackers, and she applied tubs of frosting to cement everything in place. The biggest challenge, she says, was ensuring the candy windows would hold their shape and reliably remain on the gingerbread storefront. For the Orisons storefront, Myrt Bunje went above and beyond adding fun details, including a display window showing off western apparel, street lamps and Christmas lights that actually light up, a horse and carriage, snow and evergreens. Bricks on the Orisons storefront were fashioned from “sour power belt” candy and then hand-painted with food coloring. The windows were piped with black licorice laces. Bunje then finished the structure’s exterior walls with frosting that she created to look like vintage signs and old cracked plaster. Photo by Jim Davis of Go Life Imaging. 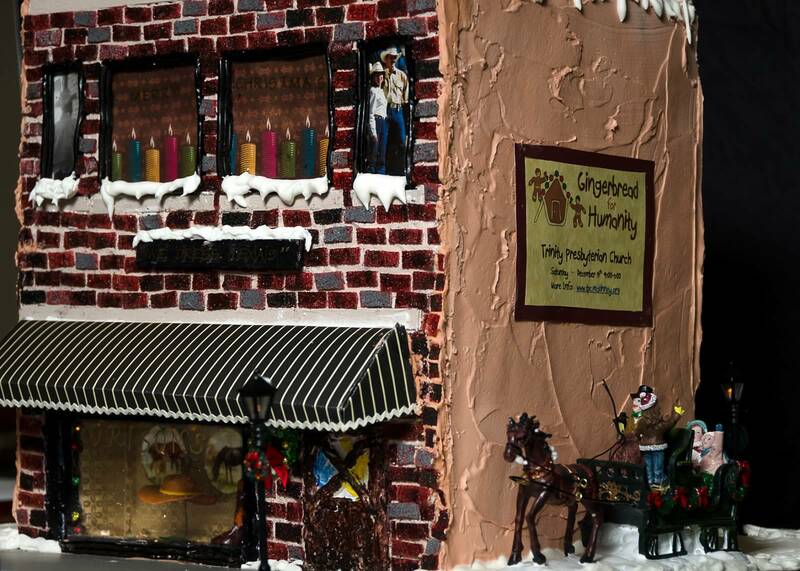 The gingerbread storefronts will be on display downtown through Saturday, Dec. 14, the day of the Gingerbread for Humanity event at Trinity Presbyterian. Anyone who cannot attend the event may still participate by registering for a take-home gingerbread kit, which comes complete with a pre-made gingerbread house, icing and lots of candy to decorate with. Please go online to www.TPCMcKinney.org and click on the gingerbread icon for details and the registration form. For many McKinney residents, enjoying Gingerbread for Humanity is part of their family’s Christmas traditions. Do something sweet for your community! Registration details: Go online to www.TPCMcKinney.org and click on the Gingerbread icon to download the registration form.